Some people may not know this but Jupiter has a huge red spot on it. That red spot is a storm traveling 270 miles per hour! It can fit three earth`s inside of it. That shows just how much bigger Jupiter is then us. Another important thing about Jupiter is that is was named after Zeus the Greek king of the gods and Jupiter the Roman king of the gods. He is the god of the sky and lightning. Did you know that Jupiter is 778.5 million km away from the sun? It is the fifth planet from the sun in between Saturn the sixth and Mars the forth planet from the sun. Also one day on Jupiter (how long it takes to rotate on its own axis) is equal to 9hs and 56mins on earth. Another fact about Jupiter is the force of gravity at its surface. The force of gravity is 24. 79m/s. Did you know that on Jupiter one year is 86 years or 4,332 days on earth? One year on Jupiter is also how long the planet takes to orbit the sun. Fun fact! Jupiter is the biggest planet in our solar system. An example of that would be that if you put all the planets in to one super planet, not including Jupiter and times it by 2 Jupiter would still be bigger. Jupiter is 69,911km. Its mass is 1.898x1027km. As apposed to Earths atmosphere which is made of oxygen, Jupiter's atmosphere is made up of hydrogen. The atmosphere for Jupiter is very thick. As for the temperature on Jupiter in the cloud tops the temperature is -145 degrees Celsius. Which is very cold to us. But if some how you managed to live on Jupiter for your whole life and came down to earth you would be very warm. Also near the center of Jupiter the temperature is 24,000 Celsius. Which is burning hot unlike earth. Did you know that Jupiter is a gas giant? Its eternal composition is mostly hydrogen in the form of a liquid. Under the cloud layers when the pressure of the interior becomes high enough the hydrogen of which Jupiter is made of changes to liquid hydrogen which gradually changes further to liquid. The description of Jupiter: Jupiter has some lines on it that are different colours. The colours are brown, badge, and white. It also has a very large red spot on it big enough to fit three earths. Another thing you might not know about Jupiter is that it has 63 moons. The planet Jupiter's four largest moons are called the Galilean satellites, after Italian astronomer Galileo Galilei, who discovered them in 1610. These large moons are named Io, Europa, Ganymede, and Callisto. Some people do not know this but Jupiter has rings. A lot of people think that only Saturn has rings but most of the other planets have rings too just not as visible. Jupiter has four sets of rings. Halo ring is the closest to Jupiter. The main ring is next, outside these two major rings are the gossamer rings. These are very faint rings that are shepherded by two of Jupiter's moons. The first is the Amalthea gossamer ring which is shepherded by Jupiter's moon Amalthea. Over lapping the Amalthea ring is the thebe gossamer ring which is shepherded by the Thebe moon. Do wonder what would happen if you went on to Jupiter without a mask? Well you would probably fare very badly. If you were to get sucked into the storm on Jupiter the winds would be moving so fast that your body would get ripped to pieces. Also some areas on Jupiter are very cold so if you were to stumble across those areas you would freeze to death almost instantly. And if your still alive at this point there are also burning hot areas which will most likely melt you. Also there is no oxygen or water so you will either die of dehydration or die of suffocation. Something special about Jupiter is that it has the shortest days out of all the planets. I hoped you learned some new facts on Jupiter! A few days ago at school we watched a Bill Nye video. It was very interesting. I learned a lot of different thing well watching it. One thing I learned was that Polaris is the north star. It is also part of the little dipper. Second I learned that ten tons of meteorites hit the earth every day. Most are the size of a grain of sand. I also learned that atoms come out of a star when it explodes. Then I learned that light travels 300,000 km a second. Did you know that a constellation is a group of stars we have given a name to help us find certain stars or recognize them? One thing that I knew before I watched the video is that the sun is a star. Those are some of the things I learned well watching Bill Nye The Science Guy. Gravity is when you drop something and it falls to the ground. Gravity is also was keeps us on the ground. That is why when you jump you will always fall down. But there is no gravity in space. That is why astronauts float instead of fall when there out in space. 2. Describe the position, motion and components of our solar system. The position of our solar system: Mercury is the closest planet to the sun next comes Venus then there is Earth. After Earth we have Mars then Jupiter. Next is Saturn, Uranus and finally Neptune. Pluto used to be a planet until a few years a go N.A.S.A named it a dwarf planet. 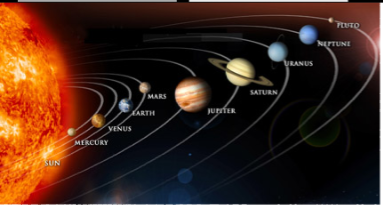 The motion of our solar system is: All the planets orbit around the sun. It takes Mercury 88 earth days do orbit the sun, Venus takes 224 earth days to orbit the sun, It takes Earth a whole year to orbit the sun. Next it takes Mars 686 earth days to orbit the sun, Jupiter takes 4,332 days, Saturn takes 10,759 days, next Uranus takes 30,687 days, Neptune takes 164.79 years and finally Pluto the dwarf plant takes 248 years to orbit the sun. Next the components of our solar system are: Planets, satellites, asteroids, comets, meteoroids/meteoroid showers, and dust. 1. Did you know that in space the skin on your feet peel off? 2. The astronauts on Apollo 11 were placed in quarantine after returning from the moon. 5. Space is not that far away. If you could drive your car upwards you be there in less then and hour. 6. Did you know the closest planet to the sun is not the hottest? Venus is! This is because Mercury doesnt have an atmosphere, so it will only be hot in the daytime when it is directly facing the sun. ​On Jupiter there is very strong winds. They travel from 225 miles per hour to 1000 miles per hour. There is also freezing temperatures of -270 degrees to +32 degrees. But on Earth the coldest has only been -94.7C. To us that is freezing, but compared to Jupiter's normal temperature earth is pretty warm. Jupiter's interior possesses an environment of pressures as great as three million times the sea-level pressure on earth, and temperatures as high as 10,000 degrees. Jupiter is a gas planet and Earth is a rock planet. Earth has water but Jupiter has some, but it's only in the cloud tops. The scale of Jupiter: Jupiter is 318 times as big as Earth. Jupiter is the biggest planet in our solar system. If the mass of all of the other planets in the solar system were combined into one "super planet," Jupiter would still be two and a half times as large. Jupiter has a radius of 69,911 kilometers, about a tenth that of the sun. The diameter of the equator is 142,984 km. The structure of our universe:The overall structure of our Universe is made up of voids and filaments, that can be broken down into super clusters, clusters, galaxy groups, and subsequently into galaxies. 4. The Earth is the only inner planet (Mercury, Venus, Earth and Mars) to have one large satellite, the Moon. ​5. The Earth is fragile. Its surface is split into plates (tectonic plates) which float on a rocky mantle – the layer between the surface of the earth, its crust, and its hot liquid core. The inside of the Earth is active and earthquakes and volcanoes and mountain building takes place along the boundaries of the tectonic plates.